HEXAGON CONSULTING(Hexagon Analysts & Consulting Services Private Ltd) is a management consulting & professional services firm based at Gurgaon, New Delhi capital region, India. Hexagon Consulting helps organisations navigate today's tough and volatile economic conditions. We support their management and organisational improvement needs -work with mid to large organizations across sectors in both developed and emerging markets like India. Hexagon Consulting’s provides management consulting & professional services to organisations in the following core practice areas, viz(i) Customer Service excellence and Customer Experience Management,(ii) Outsourcing & off shoring Consulting, (iii) General Management Consulting. Details of our practice areas are in Practice Areas tab on this site - or simply CLICK HERE to learn more on same. WE ARE NOW A PART OF A GLOBAL ALLIANCE OF PROFESSIONAL SERVICES FIRMS -PRONITED ! Hexagon Consulting is now a founder member of of PRONITED a global alliance of professional services firms headquartered in Chicago, US - which expands our reach and our ability to support you globally ! Bawa Grover is a mechanical engineer(graduate with honors ) from Punjab University, Chandigarh and MBA from XLRI, Jamshedpur and has over 30 years of rich management experience, working in reputed banking, business management & operations roles with MNC companies, including Citigroup, Tata Consultancy Services (TCS), ICICI, etc. -Before founding Hexagon Consulting, he was EVP & Chief Operating Officer and Global practice head for TCS’s International contact center operations overseeing a practice of over 7000+ employees operating in multiple countries & spanning multiple operating sites and multiple MNC clients, (including delivery sites in India, Philippines, Mexico, Europe & US). - He has served on the Board of Directors of TCS e-Serve International Ltd for a few years and was also the Chairman of the company's Audit Sub-committee. Earlier he’d served on the Board of Directors of Citigroup International Services Ltd and also on the Board of CitiFinancial India Ltd. With ICICI he has over 10 years of risk project financing and lending experience across all aspects of project due diligence evaluation, credit, operations(documentation, onsite project reviews, collections, legal, repossessions) etc - across a range of industry sectors. As country manager India he led the setting up and establishment of the Commercial lending business of Avco Financial Services Private Ltd( then a subsidiary of Textron, US), which eventually became a part of Citigroup. Given his depth of experience and his consulting interests - he now mentors CEO's and leadership of a few mid-sized IT & BPO companies in India and Singapore and is also passionately engaged in consulting engagements in each of the three core practice areas with multiple clients. Quadrangle Consulting Services Private Ltd(QC) is a twelve year old HR consulting organization, also based at Gurgaon, New Delhi region that specializes in executive assessments & leadership development and in designing business impacting HR policies & procedures including assessment & development programs, including , goal setting, performance management & compensation planning and a range of related HR led business impacting solutions for its clients. Value Space India Consultants & Services Private Limited (VALUE SPACE): A 10 year old company, focused on the education sector - operating an early childhood education center at Gurgaon in the New Delhi capital region operating under its own registered brand - the Sixth Element school (ww.sixthelement.net ) and its other educational services division – TeachersLink (www.teacherslink.org) and its social sector Trust - "TSE FOUNDATION", engaged in providing recruitment, training and social sector activities primarily for the education sector. Both QC and VALUESPACE are shareholders in .Hexagon Consulting, and we draw upon consulting/professional resources from our group companies for executing assignments and as such from a practical stand point Hexagon Consulting is an over 12 years old organisation. Incidentally, our senior consultants are normally techno-management post graduates, typically with about 7 to 30 years rich & relevant and diverse work experience both in India and multiple overseas markets. We support our clients with the highest standards of professionalism, combining cutting edge management thinking, deep domain expertise & experience of our consultants, with modern innovative operational & technology solutions. We are senior level executives from around the globe that share a common interest of improving the quality of our communities by helping Mid to large organisations succeed. We believe that globally connecting culture, knowledge, skill, technology and human resources will improve local economies. We believe this also contributes socially . Hexagon Consulting has an exclusive tie up with The International Customer Services Institute-TICSI (www.ticsi.org, UK & Dubai for India region, for bench marking /assessment / auditing/training organizations and running workshops/seminars across industries on the global customer services & customer experience management framework & certification – TISSE 2012 which is a globally accredited customer service excellence assessment framework. This enables organizations to go up the value curve on this critical measure of organisational success, by effectively delivering great customer service and customer experience to its end customers - by inter alia deploying the right operating framework, across people, processes, measurement KPIs, technologies on all its customer contact channels - on an end to end basis. Hindu Business Line :one of India's most respected business newspapers published an interesting article on Hexagon Consulting in August 2012, on we bringing in customer service standards to improve customer service levels in India. Click button above to read the article. We have a few other Global partnerships/affiliates as well which enable us to provide innovative and practical solutions for you - detailed in the partnerships-alliances tab on this website. COUNTRIES IN WHICH WE WORK: Primarily India. However our consultants are well traveled and internationally mobile, having worked extensively in multi-cultural and International markets. 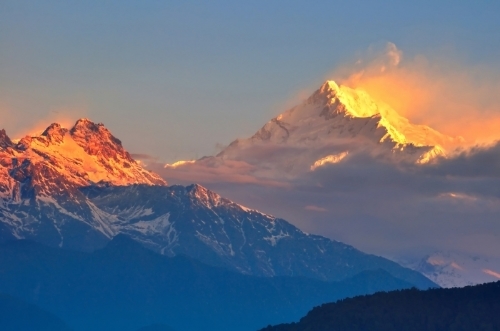 WE ARE INSPIRED BY THE RISING SUN OVER THE HIMALAYAS. THE JOURNEY IS TOUGH BUT SUCCESS IS AWESOME !